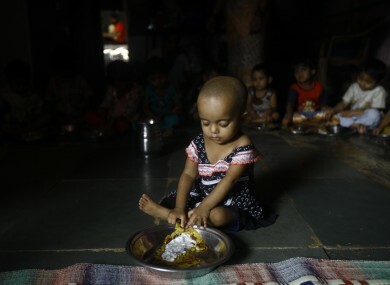 Malnourished Indian children (no names available) eat a meal at the Apanalaya center, an organization working for the betterment of slum children, in Mumbai, India, Tuesday, Oct. 9, 2012. HUNGER ON A global scale remains a major threat to the world’s poorest people, with twenty countries having levels of hunger that are now classed as “alarming” or “extremely alarming,” according to this year’s Global Hunger Index. The Annual Index report found that the unsustainable use of land, water, and energy are the biggest factors affecting the food security of the most vulnerable people around the world. Two of the three countries with extremely alarming levels – Burundi and Eritrea – are in sub-Saharan Africa; the third country is Haiti. South Asia is the other region that continues to suffer from the highest levels of hunger. The Global Hunger Index (GHI) report presents a multidimensional measure of global, regional, and national hunger using data data from the Food and Agriculture Organisation of the United Nations (FAO), the World Health Organisation (WHO), the United Nations Children’s Fund (UNICEF), various national demographic and health surveys, and International Food Policy Research Institute (IFPRI). The seventh annual report shows that, despite the proportion of hungry people around the world declining since 1990, global hunger remains at a level characterised as ‘serious’. Speaking at the launch of the report, entitled The Challenge of Hunger – Ensuring Sustainable Food Security under Land, Water, and Energy Stresses, Shane McEntee TD, said: “Last year, in addition to the ongoing programmes funded by Irish Aid, my Department provided almost €8.5 million to the World Food Programme for emergency actions and for protracted relief and recovery. We recognise the need to deal with emergencies as they occur and the special funding we provided to Haiti at the beginning of last year shows our commitment to this cause”. Email “Hunger remains 'major' global threat to world’s poorest and most vulnerable”. Feedback on “Hunger remains 'major' global threat to world’s poorest and most vulnerable”.